On Wynn Las Vegas' Lake of Dreams lies an extraordinary steakhouse. It's called SW Steakhouse, and it's presided over by Chef David Walzog. TravelsinTaste.com caught up with Chef Walzog recently to discuss the challenges of keeping a popular restaurant vibrant, serving some of the most wealthy and powerful men in the country, and his personal thoughts on running a great restaurant. Not many men can lay claim to serving three of the country's, if not the world's, most wealthy men - Bill Gates, Warren Buffet and Steve Wynn - at one table. 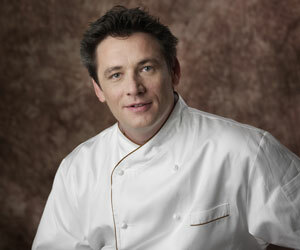 The fact that Chef Walzog can is a testament not only to the energy and quality of his restaurant, but also to him. Chef Walzog hails most recently from New York, and in the two years since he's been a part of Las Vegas culinary culture he's seen it develop into a fantastically competitive dining scene. "It's a social scene with moguls from the vast array of businesses-publishing, media, gaming, real estate," he says. "And then there are the casino guests themselves. All of these are super-sophisticated diners who know exactly what they want. Whether they are domestic or international, they have international tastes. This is the best thing about it. They come to have a great time and this is a fun aspect for the chef as everyone in the dining room is there for one reason: to eat great food. They want to be a part of this buzz of this Las Vegas dining scene, and ultimately to have a great time."